The World Social Forum (WSF) is one of the major transmission belts of the global socialist movement. 6,000 people recently gathered in Belem, Brazil to be instructed on how to advance global revolution. Now they've fanned out across the globe to spread anarchy and chaos. WSF is planning major international disruption this year to exploit the world economic meltdown, climate change, the Israel/Palestine conflict and third world ethnic tensions. 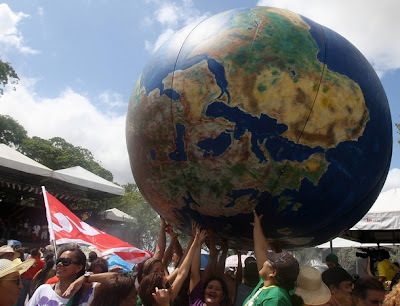 The ninth World Social Forum ended on February 1 in Belem with its “Assembly of assemblies” adopting “dozens of resolutions and proposals to be the subjects of a programme of mobilisations around the world in 2009”, according to a February 2 Inter-Press Service report. The 2009 WSF, formed as an international gathering of the global justice movement, held “21 thematic assemblies” that broke “the apparent WSF taboo on taking common political stands under pressure from thousands of civil society groups anxious to seize the opportunity opened by the global economic crisis to progressive change”, according to the IPS. As a result, global demonstrations have been planned between March 28 and April 4 to demand urgent action on climate change. IPS reported that a “key target of this initiative is the G-20 summit of industrial countries scheduled for Apr. 2 in London”. The Palestinian Day of Return, on March 30, was also marked as a day for protest against Israeli aggression. October 12, the anniversary of Spanish colonialism of the Americas has been set as another date for global actions in defence of the rights of indigenous people around the world. These included: nationalisation of banks; no reduction of workers’ wages; energy and food sovereignty for the poor; ending foreign occupations of Iraq and Afghanistan; sovereignty and autonomy for indigenous peoples; the right to land, decent work, education and health for all; and democratisation of the media. IPS claimed: “This is the closest the WSF has yet come to becoming a global political force, a dilemma it has faced since its inception in the city of Porto Alegre, in southern Brazil, in January 2001 as a counterpoint to the World Economic Forum in Davos, Switzerland. A January 30 Venezuelanalysis.com article reported that Venezuelan President Hugo Chavez spoke to a meeting of thousands on January 29 as part of the forum, in which he described Latin America’s social movements as “trenches of resistance” against global capitalism that need to go on an offensive towards creating an alternative to capitalism. “Just like Latin America and the Caribbean received the biggest dose of neoliberal venom”, Chavez said, “our continent has been the immense territory where social movements have sprouted with the greatest strength and begun to change the world”. According to Venezuelanlaysis.com, Chavez called for social movements to “step up their popular offensive toward revolutionary changes”. If Chavez and WSF get their way, 2009 will be a year of both economic and social turmoil. Well considering what is happening in Iceland I believe 2009 will be a year of social turmoil no matter what anyone does. But Chavez and WSF will use that turmoil the same way as Hitler used the ecenomic turmoil of Germany, unless we can seize the initiative. Wow, your narrow view amazes me! It's fun, isn't it, to point the finger at so-called "hardliner free-marketeers" while the very truth is that Socialists have been deliberately behind the economic collapses of places like the U.S. Capitalism itself will work forever, to the benefit of the greatest number of people than any other form of government, and has only failed (or appeared to fail) when it's demise has been calculated and deliberately enacted. Socialist jackasses like yourself can only get followers by causing problems, blaming them on others, and then claiming to have a solution to everyone's problems! Of course you can solve the problem - you ARE the problem! Well, you can solve the problem if by "solve" you mean "force everyone into poverty, take away their rights, murder dissenters, and let the leaders get fat off of the backs of the oppressed hordes." Under Capitalism, ANYONE can obtain wealth and property, and ANYONE can rise out of inherited poverty, and EVERYONE has the right to choose their own views and beliefs. Socialism is slavery. The IMF, World Bank and US Treasury are socialists? Since when did that happen? Perhaps you have an explanation for why the countries which followed the prescriptions of the IMF did so much worse than those who didn't?